The Chosun Ilbo English edition this morning ran a column entitled "Pollution from China is an International Problem." I'll say, just take a look at the accompanying photo by NASA's Aqua satellite, taken in early March of this year. 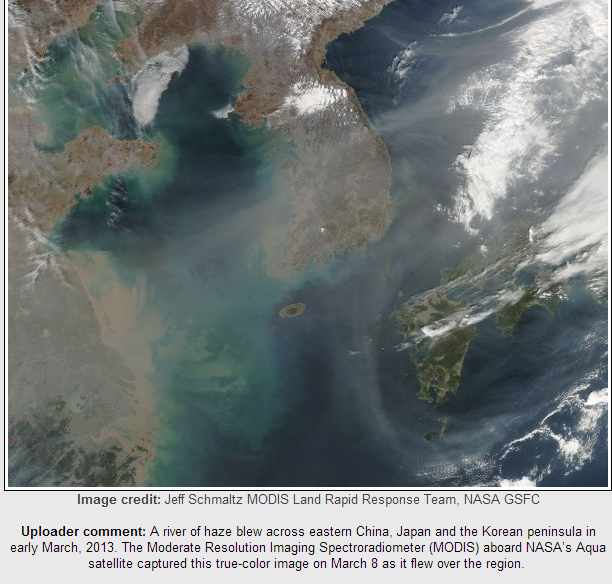 (click to see a full size version) It shows a river of haze blowing across eastern China, Korea and Japan. Photographs like this deserve to be given much wider circulation, so I'm doing my small part via this blog. There are a number of global problems to be faced these days given the global scale of manufacturing, trade, and urbanization, but the air pollution problem in China is literally deadly. The news reports from Harbin earlier this fall underscored the severity of the problem. It is one that all the nations of Northeast Asia need to tackle soon, starting with the major sources of the fine particle pollutants that are so harmful--China.